Трехмоторный и увеличенный вариант Potez IX был создан в 1922 году и получил обозначение Potez X A. Самолет рассматривался как многоцелевой транспортный для колониальных территорий и оснащался тремя двигателями Hispano-Suiza 8Aa мощностью ДальшеMore>>> 140 л. с. (один - в носовой части и два, установленные при помощи распорок между крыльями). Potez X A вмещал 10 пассажиров в кабине, расположенной в носовой части фюзеляжа, а открытая кабина пилота находилась сзади. Независимые основные стойки шасси дополняли расположенные бок о бок носовые колеса и хвостовой костыль. Позже на нем были установлены более мощные двигатели Hispano-Suiza 8Ab. Вариант Potez X B - военно-транспортный самолет с двигателями Hispano-Suiza 8Bec мощностью 280 л.с. ; Potez X C - гражданский транспортный самолет с той же силовой установкой как на Potez X B. Размах крыльев этой машины составлял 18,4 м, а максимальная взлетная масса - 3090 кг. By far the most interesting of the Potez machine is, however, the three-engined type "X.A." A photograph of this machine was published in our issue of November 17, page 764, and a silhouette on page 760 of the same issue. The machine has been designed to meet commercial conditions in France as well as in the Colonies, and in order to reduce as far as possible the effect of varying climatic conditions, it is built almost entirely of metal, chiefly Duralumin. Unfortunately, no details are available of the wing construction, but one gathers that both spars and ribs are of Duralumin, although the wing covering is fabric. In the absence of particulars, one cannot, therefore, express an opinion on the detail construction, but judging from what can be seen externally, the machine is well built and has several ingenious features which will be dealt with presently. Passenger accommodation is provided for 12 passengers, the seats being arranged in two rows along the sides, and with two seats across the front wall of the cabin. The pilot sits aft of the cabin, and is in communication with it, so that it is possible to change pilots during a long flight. The cabin portion of the fuselage is of ply-wood construction, but one gathers that the rest is built up entirely in Duralumin. The front portion carries one of the 180 h.p. Hispano-Suiza engines, which is mounted on to the cabin as a detachable unit, being capable of being reached, if necessary, during flight. The rear portion of the fuselage can also be readily detached from the cabin, so that for shipment, the large fuselage can be dismantled into three parts, neither of which requires a very large crate. The planes are, as already mentioned, of all-metal construction, with exception of the covering, which is fabric. Each plane is in four pieces, the portions outside the engine struts taking down very quickly when the rest of the machine will go into a hangar of ordinary size. One of our sketches shows the quick-release pins which secure the extensions to the wing-roots. The inter-plane struts are of Duralumin, streamline section, and are attached by pin joints to the spar fittings. It might be mentioned that the wings have been sand tested, when it was found that they had a factor of safety of 12. The two wing engines rest in vee struts, fairly high in the gap between the planes, and are so mounted as to be readily removed from their supports in case it is desired to change an engine unit. The engines are neatly cowled-in, and there is a petrol tank behind each engine. Lamblin radiators are mounted under the engine nacelles. 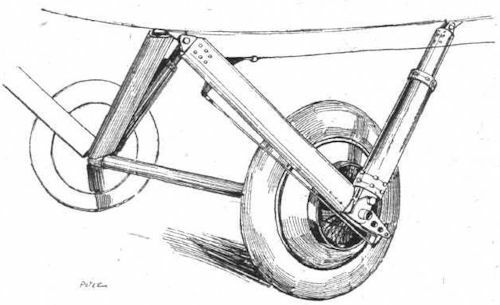 As the type "X" is intended for use over all sorts of grounds, the undercarriage is of substantial design. There is a pair of vees under each engine, one vee taking the load of its engine, and the other that of the corresponding half of the body weights. A third undercarriage is mounted under the nose engine. The wheels are so placed that the outer wheels are practically under the c.g. Wheel brakes are fitted so that it is possible to pull-up the machine after a very short run. In that case, of course, the front undercarriage prevents the machine from nosing over. The shock absorbers are somewhat similar to those familiar from Blackburn machines, and are said to give excellent progressive springing. The tail planes are of ordinary monoplane type, but auxiliary surfaces have been added to enable the machine to be flown with varying loads, and also with one of the wing engines out of action. The general arrangement of the tail is shown in one of the accompanying sketches. Above the tail plane are mounted horizontal and vertical surfaces, the former trimming the machine and the latter keeping it on its course, with one wing engine stopped. The manner in which these auxiliary surfaces are braced is rather ingenious, and very simple. A pair of vees of Duralumin streamline section tubes triangulate the auxiliary planes in both directions, and cause but little extra resistance. It is claimed that with one wing engine stopped, once the trimming rudders have been adjusted, the machine handles well on the ordinary controls, and that the only effect is that the speed with full load is reduced to about 83 m.p.h., and the ceiling to 8,200 ft. As the power expenditure, with three Hispano-Suiza engines of 180 h.p. each, is 45 h.p. per passenger carried, the machine should be quite a good commercial proposition, although its speed is not quite so high as that of some machines with a similar power expenditure per passenger. The three-engine arrangement should practically eliminate forced landings. Sufficient fuel is carried for a flight of 6 hours at a cruising speed of about 87 m.p.h., or a range of 520 miles in still air. Following are the main data relating to the Potez type "X.A": Length overall, 42 ft. 6 ins. ; span, 60 ft. 6 ins. ; height, 13 ft. 7 ins. ; wing area, 1,020 sq. ft.; weight, empty, 4,620 lbs. ; weight of fuel and oil, 1,200 lbs. ; useful load, 2,200 lbs. ; total loaded weight, 8,020 lbs. ; wing loading, 7-85 lbs./sq. ft.; power loading, 14-8 lbs./h.p. ; maximum speed near ground, 102 m.p.h. ; at 6,500 ft., 98 m.p.h. ; at 10,000 ft., 94 m.p.h. ; cruising speed, 87 m.p.h. ; maximum speed on two engines, 83 m.p.h. ; climb to 6,500 ft. in 10 mins. ; to 10,000 ft. in 17 mins. ; to 16,400 ft. in 50 mins. ; ceiling, 16,400 ft. The Henry Potez type XVIII is a three-engined commercial biplane, which is a development of the three-engined machine (type X) shown in 1921. It is fitted with three Lorraine-Dietrich engines of 270 h.p. each, two of which are mounted on V-struts between the wings, while the third is housed in the nose of the fuselage. The machine is constructed mainly of wood, the only portions which are made of metal being the engine mountings and nacelles, and the tail surfaces. Ply-wood covering is used for the fuselage as regards the cabin portion, while the rear part is fabric covered. The cabin has seating accommodation for 10-12 people, rows of chairs being ranged alongside the walls, with a central passageway between them. Behind the cabin is the W.C. and luggage compartment, while a door in the front of the cabin leads to the pilot's cockpit, placed immediately aft of the central engine. The pilot sits on the port side, and next to him is a seat for an engineer, navigator, or wireless operator. The wings are of usual construction, separated by one pair of inter-plane struts on each side, in addition to the V-struts carrying the engines. Ailerons (of the horn-balanced type) are fitted on the lower plane only. A four-wheeled undercarriage is fitted, two wheels on each side. Each pair of wheels is supported on two Vees, of which the inner runs to the fuselage while the outer meets the lower plane at the point where are attached the apices of the V engine struts. The front "legs" of each Vee are in the form of a streamline Duralumin tube, while the rear legs are telescopic and contain the shock absorbers. In the type X a pair of wheels were placed under the nose of the fuselage but in the XVIII this pair has been eliminated. Following are the characteristics of the Henry Potez XVIII: Engines, 3 Lorraines of 270 h.p. each; length o.a., 14-8 m. (48 ft. 7 ins. ); span, 22 m. (72 ft. 3 ins. ); chord, 2-8 m. (9 ft. 21 ins. ); wing area, 112 sq. m. (1,205 sq. ft.); weight empty, 2,900 kg. (6,380 lbs. ); pilot and engineer and instruments, 200 kg. (440 lbs. ); fuel for four hours, 675 kg. (1,485 lbs. ); useful load, 1,000 kg. (2,200 lbs. ); total loaded weight, 4,775 kg. (10,500 lbs. ); power loading, 13 lbs./h.p. ; wing loading, 8-72 lbs./sq. ft.; speed near ground, 195 km. (121 m.p.h. ); speed at 6,000 ft., 190 km. (118 m.p.h..; ceiling, 5,000 m. (16,400 ft.). HENRY POTEZ: The three-engined passenger machine is a development of the three-engined biplane exhibited last year. 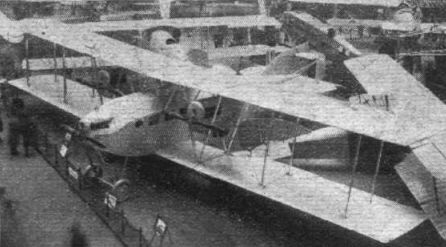 The unsuccessful but impressive twelve-passenger Potez XXII of 1922, powered by three Gnome-Rhone-built Bristol Jupiter engines. One side of undercarriage of Potez X.A. Note the band brakes. SOME POTEZ DETAILS: On the left, the attachment of a metal interplane strut. In the centre, one of the long pins by means of which the wings are attached to the centre-sections. On the right, the tail of the three-engined machine. Note the simple way in which the bracing of the auxiliary trimming plane and rudders are braced with two simple Vee struts.